Our guide will pick you up at Carnival Cruise terminal or LAX airport terminal and start our LA city tour. Carnival transfers from LAX include tour, transportation and transfer. Your luggage will be safely stored onboard our touring vehicle. You can book online here, Carnival Transfers LAX , please pick “LAX - LB tour" and we will send you a confirmation with pickup instructions after that. 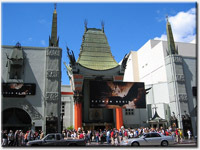 This is a unique half day LA tour to see the best of Los Angeles and to be transferred to your flight or hotel. When booking Carnival transfers from LAX, please provide the date, ship and flight number in the comment section. Check your cruise documents for your LA Carnival cruise line departure or arrival pier. Generally, Carnival ships sail out of Long Beach and Princess, Disney, Cunard, Holland America, Royal Caribbean, Celebrity, Seabourne, Costa, Regatta, Silversea and Norwegian Cruise Lines sail out of San Pedro port (port of Los Angeles). After you complete your Carnival land tour booking, your credit card will authorized and our expert shore excursion guide specialists will send you a confirmation by e-mail. *Drop off and pick up is available also at the Los Angeles World Cruise center in San Pedro, CA or Long Beach cruise terminal. Best value: you can combine shuttle transportation transfer service and travel tour together.